Taxes are a huge issue in Halifax this election. Assessments are rising at a rate that far surpasses increase in income, driving sometimes huge tax increases for residents and businesses. Taxes must fairly reflect the cost of services delivered in each tax area, our business tax rates must be competitive, and tax rates must drop as property assessments increase reflecting the rise in income. HRM has three tax rate areas: urban, suburban, and rural. Each should be set reflecting on the cost of service delivery – not in HRM as a whole, but in each tax area. Some service standards are different – it takes longer to get police or EMS response in rural HRM than urban, and the cost of service delivery is different too. Some services are cheaper in the core, some cheaper in rural, but right now the tax rate does not reflect that. Per foot of frontage could be considered as a variable when calculating the tax rate for some residential and commercial services costs and reflected in the tax paid – don’t just base tax on property value. Cost of service delivery in each of the three areas should be considered when establishing these rates. Commercial taxes in the core should be lower because the cost of service delivery is lower than elsewhere. Second, business tax rates in the core must be competitive with other medium sized cities in Canada. HRM derives new revenue from new developments and growth. Accordingly, it shouldn’t have to increase our tax bills every year. Residents know that the peninsula is where taxes are taken and investments are not made. Rather, those taxes leave and fund unsustainable sprawl. Development charges need to be levied for new lots (residential and commercial) to ensure that immediate and future cost of servicing those lots is covered by the development, not by the existing tax base. Finally, massive increases in property value should result in tax bills being raised more gradually over time. No one – commercial or residential- can afford tax bills that double in a year. Runaway assessments should not mean runaway taxes. 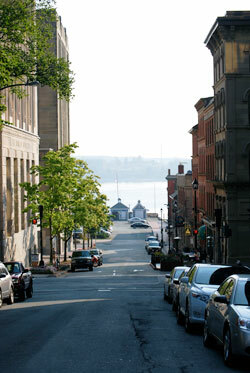 HRM should lower the residential and commercial urban tax base rate to compensate for assessment increase in the core. The average tax bill in each area should not increase by more than average income increases. Changing the way we are taxed will be the most difficult challenge facing the next council. It can only be done if we all work to make sure that taxes fairly reflect the cost of services delivered in each tax area, that our business taxes are competitive, and that tax rates drop as property assessments increase.